Passing the New Mexico written exam has never been easier. It's like having the answers before you take the test. The New Mexico Motor Vehicle Division (MVD) requires all new teenage drivers to complete the graduated driver license (GDL) program to obtain a driver's license. This instructional process is designed to slowly introduce you to traffic situations and help you become a safe driver. If you are younger than 18 years old, you will also need to complete an approved driver's education program before applying for an instruction permit. 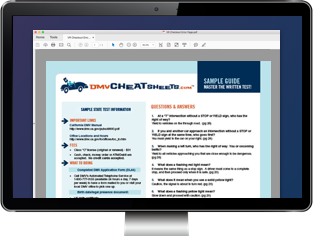 On this page, you'll find out how to apply for a New Mexico learner's permit and get to the next stages of the driver's license process. You must be at least 15 years old to apply for a learner's permit in New Mexico. Your parent or legal guardian must sign your application. Proof of enrollment OR certificate of completion for an approved driver education course. A referral card from a TSB-approved Driver’s Ed school. Provide proof of your identity, Social Security number, and NM residency. For a complete list of acceptable documents, please visit the NM MVD website. Pass a written permit test. Pay $10 for your New Mexico learner's permit application fee. The written exam in New Mexico contains a series of questions about traffic laws. You need a passing score of 80% to pass. To prepare for the exam, the MVD suggests reading the New Mexico Driver Manual. Our suggestion is to prepare with a comprehensive online practice test. Once you've passed the written test, the NM MVD will issue your learner's permit. NOTE: You can complete your written permit test as part of your Driver's Ed course if you complete the course at a MVD-contracted school. The driver's education school may also issue your learner's permit upon completion of the course. Complete an approved driver’s education course. Complete 50 hours of supervised driving practice (10 hours at night). See “Behind-the-Wheel Driving Requirements" below. Be free of any traffic violations during the 90 days prior to applying. Is at least 21 years old. Has held their driver's license for at least 3 years. You must complete 50 hours of driving practice, including 10 hours at night and keep a log of these hours. Your parent or guardian must sign your driving log. Once you fulfill the behind-the-wheel requirement and have held your learner's permit for 6 months, you're eligible to apply for your provisional driver's license. Be at least 15 1/2 years old. Have held your instruction/learner's permit for at least 6 months. Have completed your behind-the-wheel driving practice (see above). When you're ready to apply for your provisional New Mexico driver's license, visit our page on Applying for a New License (Teen Drivers) for details.